This post is going to be so lame and I might even going to delete it. HAHA ME. Dear Awesome, whats with the asthma thing? Well, peoples with asthma tend to have skin problem. It related to allergy which is to long to be elaborated so we will just keep it this way "you got some sort of skin problem if you got asthma"
usually, it may related to so called RESDUNG. Anywayyyyyyyyyyyyyyyyyy. I am so not that person who got to become really skin care cautios freak kind of person. Mainly because I never got one and at matriculation college it was not as severe as current condititon. I don't know how much stupidity I got back at that day whereby I neglect to take immediate care. Now. My skin at it worst. I need to become this kind of freak or else I easily will culture a new pimples. Oh. I learn to properly care for my skin but did not keep much to the routine so it kind of being on and off kind of way. 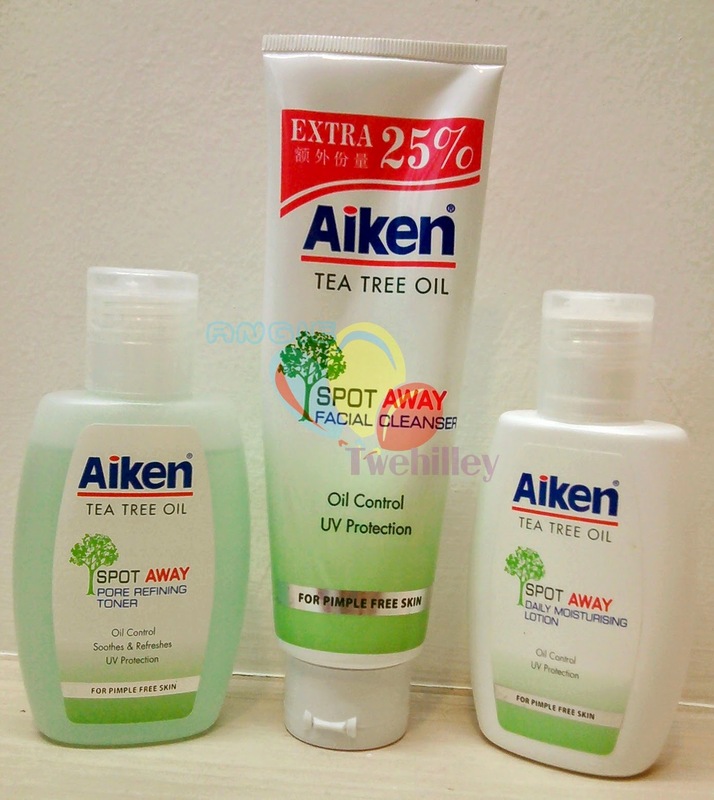 During researching for better skin care, I have tried tonnes of product and now I am sticking to Aiken. Alhamdulillah that my skin don't get weird side effect due to changing of products. Some even make my skin lighten about 2 to 3 tones brighter. But not my pimples scar however. Of course it have don't nothing to manage my pimples outbreak. 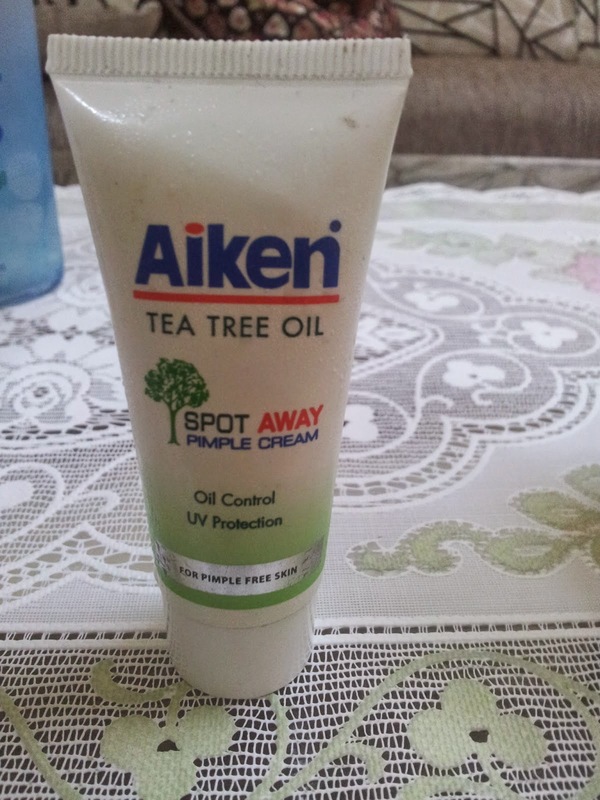 Aiken on the other work well to actually reduce my pimples outbreak + the scar. I also feel a lot more comfortable to use their cleanser. Basically, it is quite mild for an acne treatment products. I am using their cleanser, toner and cream/tea tree oil. All of these product basically have Tea Tree Oil as it main substance for anti acne properties. They also have moisturizer and I do love how it make my skin look hydrated but then my skin look much oily thus I have stop using it. The best way for me to use this products is to clean my face twice daily and followed by toner. Then I will apply the cream (after cleaning my face) and place when I got pimples or prone to have pimples outbreak. The cream and oil really work well to fight the acne like those Oxy cream. Basically, those are using benzoyl peroxide while this Aiken products are using Tea Tree Oil. The cream is much milder than the oil one's and of course less oily. Since the oily were making my skin look too oily, I only applied it before sleep or if i am staying in my room in the day. This have at some reduces the speed of effectiveness as compared when i am using the cream one. Effectiveness here meaning to get skin like my left cheek (picture below). Though oil ones are quite strong it give like scale where you can actually peel it off. I think it got pengelupasan thingy. Oil does effectively kill the pimples faster though I am not using it as frequent as the cream. But, i am not much of a fan when it seem like the scar are getting somewhat worse. It will go off eventually but with my on/off mode, its going to be a long time. As you can see, my left cheek is better than my right cheek. This is because (why does it feel like I am doing those lab reports??) during my rajin/diciplined time I managed to tone down my left cheek. My right cheek always got more pimples but since I don't do much care now, the pimples start to bermaharajalela back. On the other hand, my left cheek is rather spared since the pimples are, well, kind of all gone thus rendering its ability to outbreak. Pimple my fellow friend is the blockage of pores gone bad with the help of bacteria. That is why it is sort of localizing it outbreak. The act of not caring much of your skin makes it a suitable place for it to live. Not to meantion additional predisposing factor like hormonal imbalance and stuff. Yes. The perks of being pharmacy student. Discusing on predisposing factors for MY pimples outbreak. These is my issues. Point 2 to 4 is where I couldn't help myself at all. My life curently is having all sort of stress. Though if won't affect much on my emotion it surely somehow affect so much to my skin. How bad it is? imagine waking up with two to three pimples magically arise from nowhere. It is usually swollen thus making it look hideous. It usually now arise around my mouth area and my chin. Mostly it will become even worst when I keep on kopek the parut and stuff. Another problem is, the pimples scar won't go away. I have tried not to pick it and stuff cause they say it cause the scar. But it is still there!! And since area around scars got pimples, I couldn't apply the scar cream as I want to apply the acne cream. Basically, if I get to routinely do the twice daily wash + toner + cream/oil it will surely help. I need to also quickly wash my skin with water when it gets too oily and wipe it dry. Occasionally, I will put those mask to remove clogged pores which not only remove the pores, I will also less scartching skin and some Savee mask every now and then. Lastly, I need to stop touching my face especially with lotion on. Salam sis, im using Aiken product cleanser/toner/moisturizer/tea tree oil n so far my face is getting better day by day.. But for the scar, it seems like susah nk hilang la.. I've tried tonnes of product b4 n no 1 can help my skin problem except this Aiken even tak 100% la kan atleast ad improvement.. I really999 love this moisturizer coz dia xbuat muka sy brminyak.. Maybe laen org laen effect kot, coz sy dh try lots of moisturizer n Aiken jgk yg trbaik so far.. N i also taking Vit C injection for every week, beli on9 n bought to clinic sruh doc inject je.. Yg bestnye, pimple kt bhgian rahang sy yg dh brbulan2 xhilang trus gone mcm tu je.. Mmg best, sy ambik injection brand Glutax Gold Velocity n jerawat batu yg sblom nie ad 4 5 ketul skli kluar brbulan nk mngecut skjp je kecut dlm mase 1 or 2 week.. Sy sarankn sis ambik injection vit c je, beli la kt mne2 trusted seller yg jual original sbb klau nk beli kt klinik mmg mahal gila !! Doc kt klinik yg sy jab tu pn ckp yg dia ambik vit c injection jgk sbb dh mmcm produk dia guna utk masalah jerawat n until now xjmpe solution, vit c tu direct msok dlm salur darah n seriously jerawat mmg ketara mengecut.. Sy xjual, tpi hnya suggest kt sis je spaye ambik vit c injection, dia jab kt iv.. However, this Aiken product is highly recommended.. Haha, sy lelaki n ad masalah jerawat.. Confident lvl mmg down gila bila brdepan dgn awek2 cun or public.. So asal xde jerawat melambak kt muka pn xpe la even ad bnyk kesan parut n open pores.. Jnji benjol2 kt muka xketara sgt.. Alhamdulillah sgt, duit mmg dh bnyk abis ler sblom jmpe Aiken n jab vit c nie.. Now dh jmpe solution wlaupon msih ad 1 2 jerawat n parut bnyk, atleast keyakinan diri tu bransur pulih.. Sy sarankn sis jgn pakai apa2 krim wktu siang n mlm sbb sinsitive skin nie mmg alah dgn krim majoritinye.. Mcm sy nie, klau apply any cream on my face, mule la rse muka miang2 mcm ad hama.. 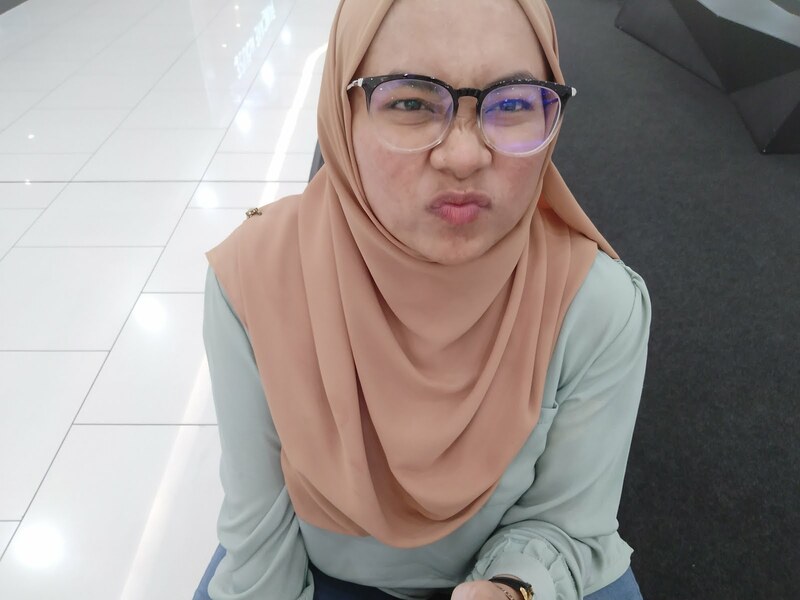 So day n night sy hnye apply moisturizer je.. Siang cleanser/toner/moisturizer.. Malam cleanser/toner/tea tree oil/moisturizer.. Jgn pakai ape2 krim yer sis jncluding BB cream.. Just stick with 1 product mean jgn pakai make up ler, sbb nk kasi muka tu free from pimple 1st k.. N jgn cpt trpedaya dgn ape2 produk kecantikan kt iklan tv ke, fb ke, insta ke, etc. sbb most of it bnyk mnggunakn mercury.. Tu je yg sy mmpu share.. Salam..
thanksss..terharu ada org care cenggini.. will consider ur points! sis cba pakai 100% cold pressed argan oil atu virgin coconut oil..
Salam sis,, nak tanya,, where can i get tthat aiken 100 tea tree oil ye? Very hard to find lah.. tq sis.. Try pharmacy or watson/guardian etc. Toner nya bagus ke tok ilngkn beks jerewt? kalau jerawat baru, oil punya sgt effective. utk parut kena pakai oil yg khas utk parut mcm bio oil. How's your face these days? Masih guna aiken ke? Saya dah cuba cleanser and tea tree oil dah hampir setahun. I didn't use moisturizer because I have oily skin it will only worsen my skin. My skin improves but still have those scars and whiteheads. Maybe I need to use some special cream next. I heard cosrx is great these days but pricey. Watsons just introduced it this year. would you mind checking my latest update about this, it kind of complicated to explain. THIS TOOK A LOT OF COURAGE SO THANKS FOR THE GOOD THOUGHTS! My school girl grand daughter is having the same problem. She is using Aiken product too. I see little improvement. May be she too is not very disiplined. Keep picking on the pimples and also may be not washing her hair/scalp throughly. In my young 'pimple' years i only used warm salt water( very dilute) and sometimes the inner side of limau kasturi peel to rub gently on the face. It worked for me. Those days we didn't have Aiken hehehe. Memang saya pon dulu bekas penghidap jerawat teruk. Ngeri bila pikir balik. siap ke dermatologist dan buat treatment setahun. ok la improve. So sekarang memang tak berani pakai apa-apa produk pon. huhuhu..
betul, elok jangan pakai apa. kena pakai pon produk yang jenis kurang chemicals kalau tak boleh risiko jadi balik. bwtul tu, makanan pentinggg. Pastu kena rajin exercise lagi. Kalau saya problem makanan yg alergik, satgi dia gatal tu la habis garu muka semua. Alergik ke sis. 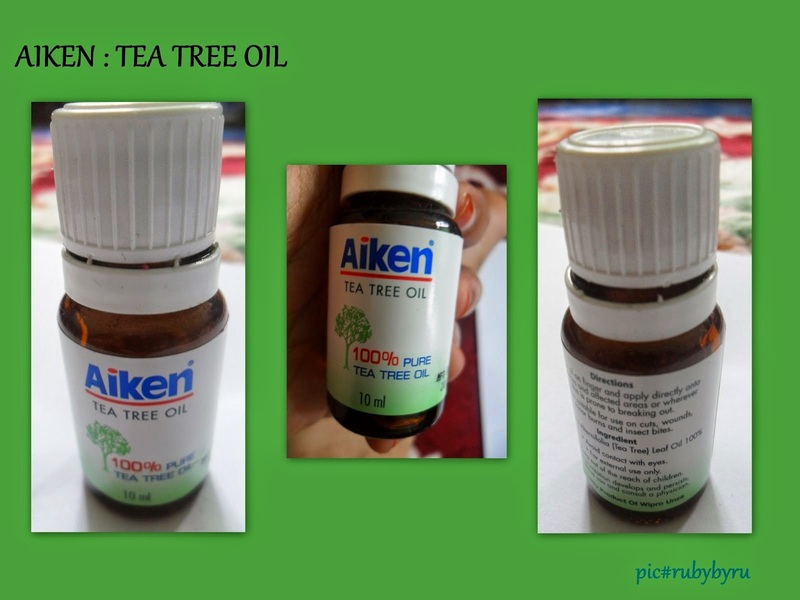 So kena cuba selesaikan masalah alergi tu dulu insyaAllah okey kan.
Pakai aiken tea tree oil nie berape lame jerawat hilang ??? Amik mase 2-3 hari or berbulan ??? dalam 2 3 hari boleh hilang, kalau jenis jerawat biasa. dia bagi cepat elok je bukan rawatan total. hi sis, i just want to share my experience too. i think u shud stop using any powder, bedak or BB cream even johnson talc powder whatever it is i think u shud stop, cuz to avoid blocked pore. if u still using them, u need to cleansing it well by using makeup remover..to make sure ur pore is breathing eventho only baby johnson talc u still need to remove it by makeup remover.. kalau tak, akan blocked pore and akan jadi jerawat. i know feel tak confident, but better to recover first dari long term jerawat keep naik. and then, dont wash slalu muka kulit kering lagi senang nk breakout.. u need to moisture ur skin slalu... so lets say u pakai bedak johnson tu, then u nk basuh remove it first.. then cleansing aiken.. then best time to put moisture within 2 minutes after dah basuh muka... laju2 letak moisture.. and u know what, raw honey help me out alot.. b4 this i pnye kulit kering and oily, i guna RAW HONEY ORIGINAL as moisture i pnye jerawat makin kecut and bekas jerawat makin pudar. juz around MYR25.00 and i muka i dah tak oily and im so happy, so my advise stop pakai bedak and slalu pakai mositure. u kluar pon after wash face wear moisture... tido pon wear moisture.. now kulit i tak kering sgt and tak oily..
hi sis, based on my experience.. i know that feeling tak confident tu ade. but first i think u shudnt wear any cream or powder, even johnson talc. sbb dia akan block pore and akan jadi jerawat. kalau u pakai pon eventho baby powder u need to clean it well using makeup remover i suggest garnier for acne blue color juz MYR 10.00 . then, dont wash slalu sbb kulit kering akan buat kan kulit jadi oily sbb kene cahaya matahari UF and jadikan kulit lebih breakout. to do so, jgn make ur kulit kering. so avoid wash byk kali. juz twice a day. to avoid kulit kering u shud use moisturizer. the best time to se moisturizer after u wash with cleaner then apply moisturizer aiken laju2. and ni based on experience even google pon approved this. use RAW HONEY ORIGINAL as moisturizer! mybe 2 hari skali sbb i pakai jerawat i kecut and bekas jerawat makin pudar. i think u shud try this. only MYR25.00 and im so happy.. so now i tak pakai any powder ke ape i just guna moisturizer. pagi.. and nak tido... muka i skg tak oily jerawat pon byk kecut, bekas jerawat pon makin pudar and kulit makin lembut..